Filipinos are well known for having a soft spot for food especially sweets. The different desserts and Filipino snacks made of glutinous rice flour, or sticky rice is an indication that Pinoy just have a sweet tooth. In the Philippines, there are several types of kakanin as most regions have their own version of the popular native delicacies or kakanin. If you have been living outside the country or a foreign traveler visiting the Philippines for the first time, I suggest you try the Filipino kakanin as most of the native delicacies are labor of love. Take note, most of the traditional kakanin takes time to prepare, which is why most people would simply buy than prepare the food themselves to save time. Kakanin Pinoy usually served as dessert and merienda, with matching coffee, chocolate drink, sago and gulaman or soft drinks. 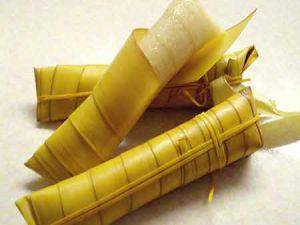 Furthermore, since kakanin Filipino are excellent for desserts, there is no doubt, you can find one or two of kakanin in Pinoy party, or celebration. The following are Filipino kakanin foods to try when in the Philippines. 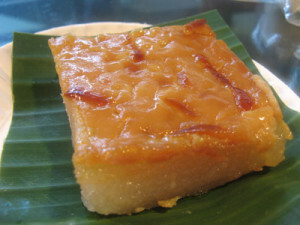 Biko is a popular filipino kakanin, made of sticky rice, brown sugar and coconut milk. Biko is eaten as a mid-afternoon snack and as a dessert. Most of the time, the rice cake, is placed over a banana leaves and bilao. Biko is perfect for birthday parties, town fiestas, family reunions and other special occasions. Cassava cake is one of my favorite kakanin as this native delicacy simply tastes awesome and fantastic to eat anytime of the day. Cassava cake is made of grated cassava, coconut milk, butter, and egg. Sapin sapin in English simply means “layers” as this kakanin is made of layered glutinous rice, sugar, water, coconut milk, coconut flakes and coloring. 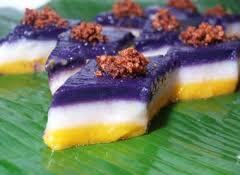 Sapin Sapin is perfect for merienda and desserts, great to bring to parties as well and other celebration. 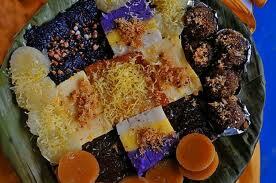 You can easily recognize Sapin Sapin because of the colored layers of the food. 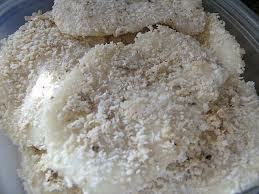 Palitaw is a local delicacy made of glutinous rice, sugar, sesame seeds, and grated coconut. 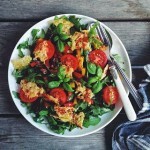 It is easy to cook, taste great and easy to chew. 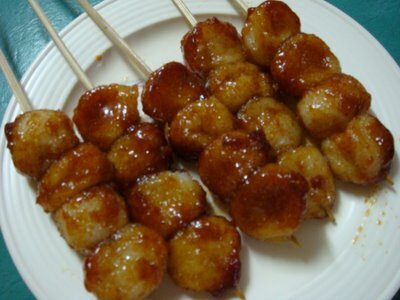 You can eat Palitaw in the morning or afternoon as snack. This native delicacy is also a popular Filipino street food. Carioca is made from sweetened coconut (shredded) and sweet rice flour. Carioca balls are easily recognizable since it is the only kakanin skewered for easy eating. 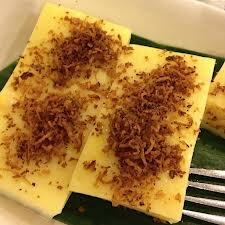 Puto is a rice cake made of rice flour, sugar, evaporated milk or coconut milk and cheese (topping). They come in large and bite sizes, and definitely fulfilling. Puto is the partner of another Filipino delicacy, which is dinuguan or hot chocolate. This kakanin is best eaten straight from the steamer. Kutsinta is usually eaten with freshly grated coconut as the brown rice cake always goes hand in hand with another Filipino kakanin, puto. Suman is a steamed rice cake wrapped in banana leaves before cooked. 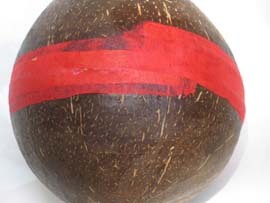 This kakanin is best served with grated coconut, sugar, or latik. By the way, suman is also great to eat when pan-fried. Maja Blanca also known as coconut pudding is a native delicacy made of coconut milk. Maja Blanca is usually served during holidays, fiestas and Christmas since it is easy to prepare. 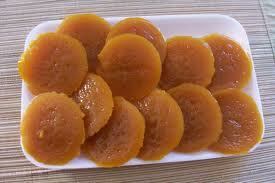 Kalamay is a sticky delicacy that is very popular in many regions across the country. 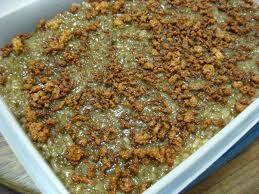 Kalamay or calamay is made of brown sugar, coconut milk and grounded glutinous rice. 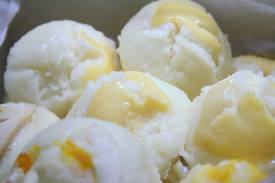 This native delicacy comes in different flavor such as vanilla, peanut butter, and margarine. 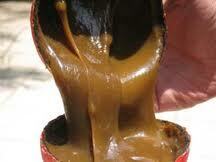 Many Filipino eat kalamay as is and they used it as a sweetener for other Pinoy kakanin like Biko or suman, as well. The Philippines has 7, 101 islands, and most of the regions offer something delicious to the Pinoy and foreign tourists. The fact that Filipino loves their desserts as much as they love their exotic dishes ensures that you will never run out of food selection especially when it comes to Filipino kakanin. So, when you are in the country, I highly recommend that you try one or all of the Filipino kakanin to experience Philippines.